CAN YOU IMAGINE COMING HOME TO A PLACE THAT IS REALLY YOURS ? I’m going to ask you not to read any further until you’ve had a good think about what it would be like for you. This question is asked by Shay Salomon in her must see book ” LITTLE HOUSE ON A SMALL PLANET ” . She points out that owning the house is a whole lot different to owning the mortgage. If you own the house it cannot be taken away from you. The banks can go bust, the world can be in recession, but when you drive home and look up the driveway, you can say to yourself ; “Yes – This is Mine, really mine”, and no one can take it from me . With current house prices in the 3 to $400,000 price range, wage stress and falling job figures, you would have to ask yourself; Do I have any other option than to sign up to a 25 year (or more) mortgage that can take as much as 50% of my after tax income ? Compare that situation to another option. 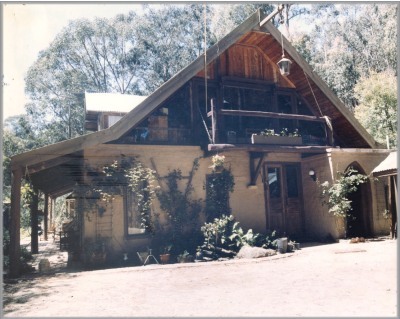 We have to accept that this home was built by a family committed to living in balance with the environment, it was their first serious building experience, Mudbricks were made from the soil and the first floor beams were adzed from the trees that had been felled to make the house site, windows and doors were recycled. 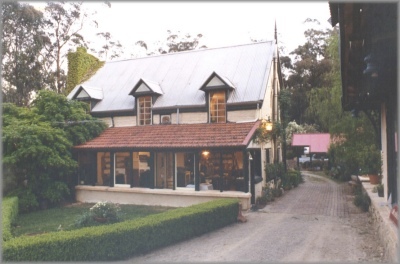 First mudbrick home was made from the soil on which it stood. After selling this home which was built over a number of years, they were able to build a new timberframe and mudbrick home, rent it and spend the next 18 months living on a barge traveling the canals of Holland, France and Belgium. All of those alternatives plus the immense satisfaction of creating their own special place in the world. OK you should ask, but what can I do and where would I start ? THE ANSWER IS HERE… Not just this site, but the whole internet network. Follow every lead, dig into every corner and you’ll be amazed at what you can find out. Use your community library and ask questions on blogs and websites like this one. We’re not going to pretend that the path to the THE GOOD LIFE is easy, where you can sit back and just watch it happen, but it is certainly achievable as ASPHIXIA has already shown us its about getting our hands in the dirt. Learning some new, simple skills and challenging ourselves.I can assure you that the satisfaction you gain is more than equal to the effort that you put in, and it lasts forever. After we have introduced you to some of the advantages and benefits of building smarter, we plan to give some useful tips and ideas that can help you get started. We’ll begin with some useful ideas about where to put this, your new home. Picture yourself buying a new computer, traveling or maybe just taking a few months off work without feeling guilty. Whatever you choose to do with that 50% of your income that is not going to the bank or lender, it’s a great feeling knowing that when you finish work at the end of the week that you don’t have to give half of it away. Often doing everthing from design to complete construction. Despite our web name this site is not just about mudbricks, but about using natural materials, whatever you have available or close by that has been used for hundreds, even thousands of years to give shelter and comfort. To finish let us remind you, THE END RESULT IS NOT JUST ABOUT THE MONEY.